Cost: 20” pizze at £20 each, or individual slices at £4, soft drinks £2, craft beers £5, Camden Hells Lager priced at £2.50 and £4 for half or full pint, £4 to £5 for a 125ml glass of wine. About: Homeslice, in the heart of Covent Garden in the busy Neal’s Yard, serves pizza by the 20 inch size, all at £20, or individual slices for £4 for three of the most popular flavours. 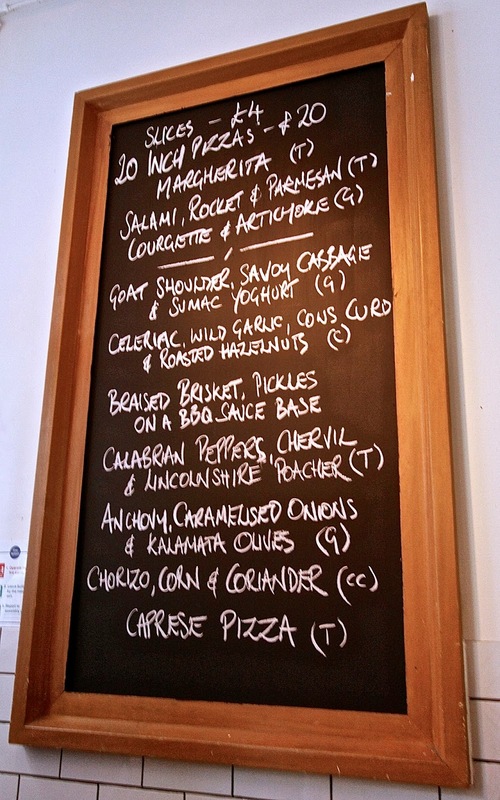 Flavours change seasonally, with one or two pizzas making an appearance every few weeks. On our visit, beyond the Margherita and Caprese, there were also some unusual pizza toppings including: Calabrian peppers, chervil and Lincolnshire Poacher; celeriac with wild garlic, cows curd and roasted hazelnuts; chorizo, corn and coriander; and braised beef brisket with pickles on a barbecue sauce base. Owned by a Kiwi and two other business partners, Homeslice started as a street-food venue in East London in 2011. Their first permanent restaurant in Covent Garden opened in May 2013 with a new branch opening in Fitzrovia's Wells Street in the summer of 2015. This is pizza not as you know it - expect some unusual but surprisingly great flavour combinations. With plain wooden tables, benches and floors, paper plates and no cutlery, no menu and blaring rock music, to state that the place has an informal feel about it would be an understatement. But not in a bad way - I enjoyed the raucous vibe of the place, the chatter and the eavesdropping possibilities. On the Sunday evening we were there, the queue was long. Homeslice does not take advance bookings so queuing is to be expected. What We Ate: The 20 inch pizzas can be ordered with up to two flavours, and we opted for a combination of (1) goat’s shoulder with savoy cabbage and sumac yoghurt and (2) anchovy, caramelised onions and Kalamata olives. The sumac yoghurt had a refreshing tartness and flavour that cut through the richness of the goats shoulder, with the cabbage adding a crunchy texture. We really enjoyed this unusual topping. The anchovy pizza, a more traditional combination of flavours known as the Napoletana, was also very delicious. Pizzas are served whole on a large wooden platter, and diners cut it for themselves. The dough is thin, proved for 36 hours, and cooked through in a smouldering wood oven to give a delicious charred flavour. 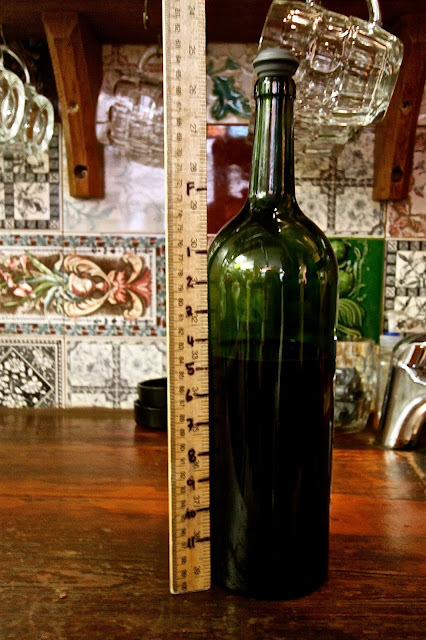 A standard pizza is 9 inches, but here they serve 20 inches, so it is more than enough for two people. The pizza is served with no cutlery, and the base was so thin and soft that we had to roll it up and eat it with the fingers like a wrap. But it's none the worse for that. So be prepared to get your hands dirty. What We Drank: For wine, there is a choice of house red, white or Prosecco (£4.50 per glass). Bottles of unlabelled 1.5L house wine are brought to the table, and diners are charged for the volume they drink as measured by a ruler when the bill is requested. With a limited choice of unlabelled house wines, we decided to go for beer, and that was a good decision. 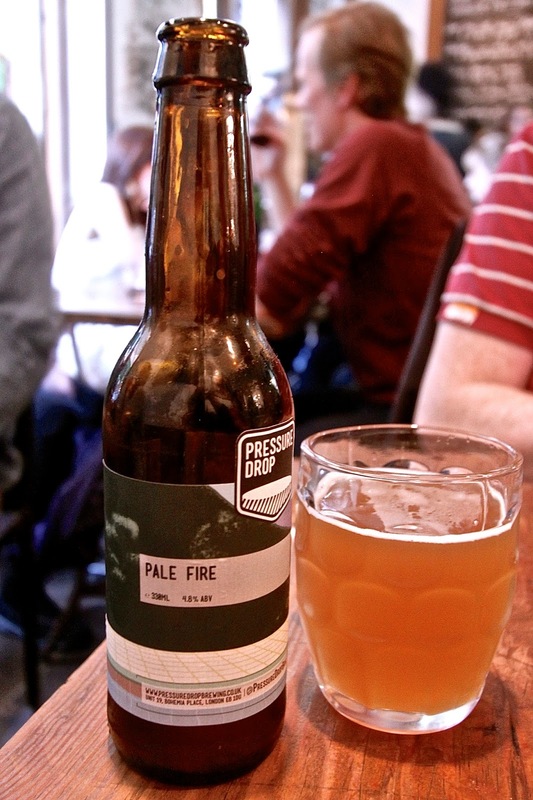 We had a pint of Camden Hells lager (£4.50), and a 330ml bottle of Pressure Drop Pale Fire pale ale (£5), with some lovely toasty hoppy, aromatic flavour, this was a great discovery and an ale I shall be looking out for from now on. All the beers on the menu are brewed in London. Likes: we loved our choice of pizza and craft beers, it was refreshing to be served tap water freely available on arrival. Dislikes: tables are cramped (the pizza occupies 90% of it). There is no drinks menu, and waiting staff, while friendly, did not on our visit know the prices of drinks. Verdict: Homeslice serves huge 20” pizze with bold flavours and creative combinations of ingredients that work a treat! There are no frills, but if you come prepared to roll up your sleeves and get your hands dirty, there is some great pizza and beer on offer. Recommended.